This is a swap for anything that would be helpful for kids cooking in the kitchen. I could be an assortment of recipes that either you kids LOVE to eat or they love to make, a kids cookbook, kids sized aprons or utensil (is there any such thing?). Whatever, be creative.... Mostly I figured that people would exchange recipes, but then I saw the most adorable kids aprons the other day.... 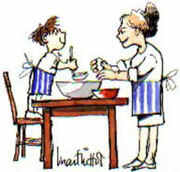 So whatever you want with the expectation that you will get at least a number of kid friendly recipes (8-10) in return. I wanted to ask why some of the members of the swap have their profiles blank? It makes it hard to work out what they would like! My profile is blank, but it does link to my blog which says it all! The sign up date has passed, but I haven't got details of my partner via e-mail and clicking the link above brings me a blank pop-up (with ads!). HELP. I get that too and I've tried it in Explorer and Firefox and I also only get the ads. I wonder if something is broken. It's ok, there was only one blank person and I see they've dropped themselves from the swap - everyone else has photos or blogs or a profile. It's nice to know what age the kids are and stuff before you try and tailor something to the recipient. Is anyone interested in extending the mail-by date of July 10? Without knowing what ages of children I'm dealing with I haven't started assembling anything. But I still can't see who my partner is. I'd like to sew a couple things, once I know, but I could use an extra week to make a really nice package. Sure, We could extend the mail to say July 17th? What do people think of that? Yes please - it would mean I can do a much more personal package. Thanks for extending the date! I still have a blank page and although I have loads of ideas I haven't done anything yet while I wait to see who I get. Hi all, I got my partner! I'm really excited, but I'm not sure the ages and sexes of their children. I'll start with mine, and if anyone else wants to chime in please do. I have one boy, age 14 months. His name is Sebastian (Binx is his nickname). Larissa, how is this for co-incidence - my oldest son is Sebastian too and his nickname is Bing! He is six and we are so not allowed to use his nickname out of the house. My youngest son is Joe (short for Joachim) and he is turning 4 this August. I think I ust be a bit slow on this one as I have just made it look like I have sent my package already and believe me I have so not. Does anyone know how I can get this changed back again? No idea how it gets corrected! Maybe contact the swap owner? Don't worry about pressing the sent button "little pink toes". Just send it by the date. I did that once recently on accident and there isn't a way to change it back. I am so sorry, I thought I'd be brave and upload a photo of the lovely package we received, but the picture has come out HUGE! Apologies, and any advice on how to fix this/avoid in the future would be very welcome! Your package looks great! I reckon you should ask Travis why the photo came out so big when you posted it. So very excited to hear about everyone's little finds... mine hasn't arrived yet. Has anyone else's? Mine hasn't arrived at it's destination yet. I hope it's not lost! I received mine and left feedback. My kids loved the books they received. Received mine. Ultra Fantastic! Will post a photo soon. Any news on how to avoid the "large image" problem when posting? I never got a darn thing. Why do people sign up just to flake out? I sent mine on the posting date, but bear in mind I'm posting from Europe to the US. If mine hasn't arrived in another week or so I'll get ready to resend.